Wow... these were quick to paint! 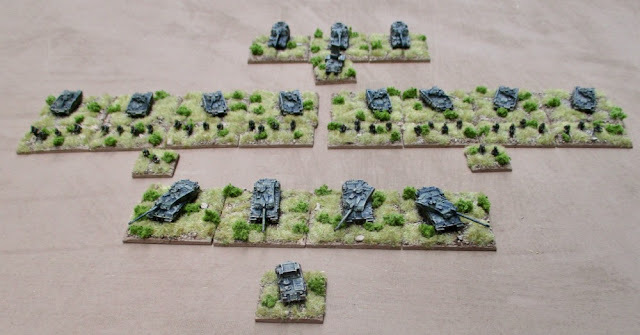 I finished up the the last elements of my Modern British Combat Command box from GHQ models - the Warrior IFVs and AS-90 self-propelled artillery. The latest: AS-90s and Warrior IFVs. A battery of AS-90 155mm self-propelled guns. This is the complete battlegroup (so far...). My plan it to use these with Cold War Commander. 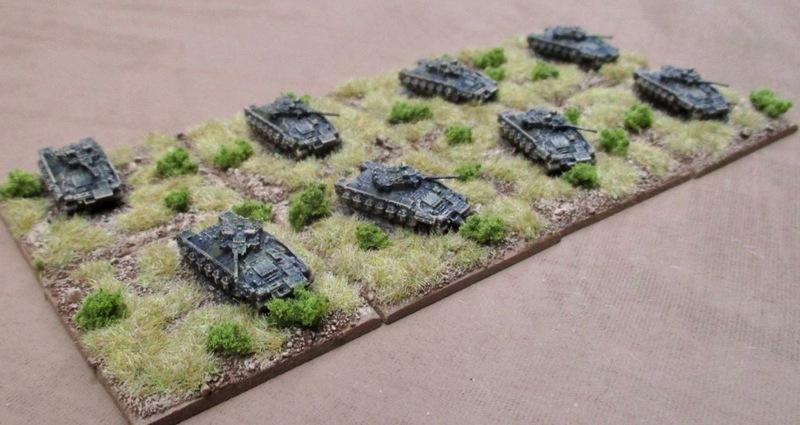 The battlegroup includes an armoured squadron of Challenger 2 tanks, two reinforced companies of mechanized infantry mounted in Warrior IFVs, and a battery of self-propelled artillery (each element represents roughly a platoon/troop-sized unit). 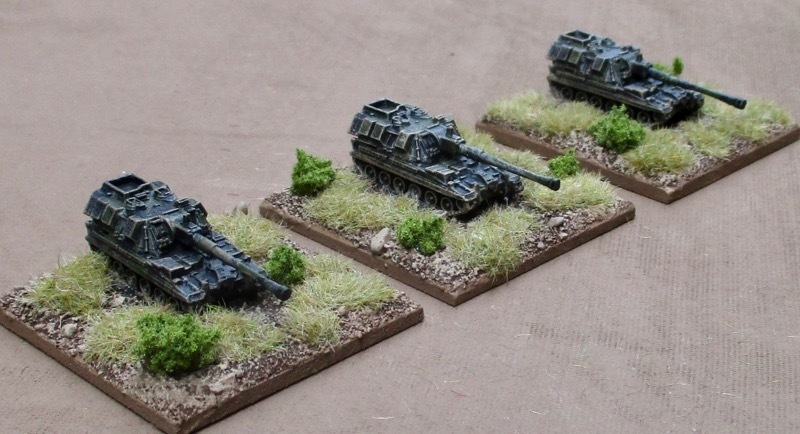 I might need to change a few things around when I re-read the rules - not totally sure if the FV436 with a Cymbeline mortar locating radar should be an HQ for the Artillery or an FAO...? Do I need both? At some point I'd like to add a few other elements - some FAOs and FACs (not sure if those should be in Land Rovers or Sultan CVR(T)s?) and some sort of recce elements (Scimitars?) and maybe some sort of air support for those FACs to call in (Harrier?). What else does this force need? I picked up two potential opposing forces - a Soviet battlegroup armed with T-80s and BMP-2s and a Chinese PLA battle group armed with T-98 MBTs and Type 89 IFVs. I imagine using it against the former in a later Cold-War-Turns-Hot scenarios in Europe. Later because the Challenger didn't com into service until the later 90s. I guess we could assume the Soviet army cracked down a little harder in 89 and prevented German reunification and/or the 91 soup d'etat by soviet hardliners was more successful - which precipitated a further decline in east-west relations. Or maybe something along the line of what went down in the original Twilight: 2000 (although we'd have to assume that the Challenger 2s were rushed into production a little earlier to be online before the limited nuclear exchange that effectively ended civilization in that game). Against the Chinese...? Well the T-98 wasn't ready until 1999 and never actually entered service with the Chinese PLA!? (Seems an odd choice to include in a Chinese PLA Combat Team box...?) A small number were made ready for trials in 96, so maybe we could say they were rushed into production a little early to forcibly take back Hong Kong when handover negotiations broke down and the British decided they were unwilling to give up their investment in the colony...? Or perhaps coming to the aid of another former colony/Commonwealth partner when the Chinese decided to invade...? I'm not sure who...? India...? Myanmar..? I don't know... it all seems like a bit of a stretch. I also have a USMC task force I'm working on... could they be a potential opponent. Maybe the the British decide to Make America Great (Britain) Again...?! Or perhaps the US invades the island to stop them from taking all their jobs...? Maybe I'm getting a bit silly... but then, in today's political climate, nothing really seems THAT farfetched anymore! Gosh,blink and you've knocked all the Brits out! Speculating on a fantasy of who against who at the moment is just worrying! Well the British camouflage was really easy. The Americans will take a bit more time. The Soviets might be equally quick if I do them in plain drab green - which, for most of the Cold War, is how their vehicles were painted. I was thinking along the same lines last night - the worrying ramifications of each of these potential match-ups - and though for a moment I should go with the most ridiculously unlikely as that might keep me from worrying about it... but then I had a hard time actually trying to decide what that would be!? I mean, after that press conference in Helsinki the US-Russian conflict seemed the least likely... of course the following day with the POTUS completely doubling back on his comments... I'm not so sure anymore?! What INTERESTING times we live in, indeed! Maybe it's time to go back to painting 40K as it's a little less gloomy! Very impressive. I may someday try out this scale. Thanks, Dean. I can understand why so many people love it - things can paint up so fast! I don't LOVE it - but I think it will work really well for Cold War Commander. Don't expect me to be expanding into other areas with micro-minis. I love the 28mm too much. I'm a little rusty with CWC, but aren't recce units basically the points of the unit +20? So if you want infantry recce, it's 50 pts. You can put it in a softskin Land Rover for whatever the vehicle cost is +20. I definitely think you want an observer for your artillery. I'm not so sure about needing an HQ for them. But as I said, it's been quite a while since I played CWC. The Recce stuff seems to have its own stat-line and point costs. I'm currently just using Infantry for a couple of the HQs because that's what came with the boxed set. I would prefer to use some light armoured command vehicle for HQs and FAO/FACs with mechanized forces (perhaps the Sultan CVR(t) - if those were being used with these forces the the late 90s... the HQs should probably just be another Warrior/Challnger...?). At some point I will definitely replace the ones I've got. I think I have some 1/100 aircraft I could potentially use. Yes, they're different scales - but it could give the whole scene some forced perspective when looking down on the table from above! When I used to play WW1 air combat, I used my 2mm terrain to put a little variety on my green cloth and make a change to fighting over trenches. Looked the business. Great work Tim - I didn't have a great experience with Cold War Commander, but the figures look wonderful, and I hope you enjoy the game! I was playing it a fair bit about a decade ago (with 20mm miniatures!?) and had some fun with it. Hoping it's as good as I remember it. One of those games that I think it depends a LOT who you're playing with. (Mind you, MOST games depend a lot on who you are playing with...). Might have liked to have tried Modern Spearhead, but the rules aren't so easy to come by these days... Not much of anything on the market for battalion/brigade/division level modern games. Everything is all about low level skirmishing. Beautiful work, can you tell me the process for those bases? :) they look awesome! The bases are 1/8" MDF that I cut to 30mmx30mm squares. I bevel the edges with a blade. After the miniatures are secured I spread glue (Weldbond) on the base and sprinkle on sand. I use a base coat of a dark brown. Then I to a heavy dry brush with a lighter brown (which is also the brown I use on the edges of the base) and do. Lighter drybrush with a light tan colour. I glue on some static grass - pressing it into random blobs of glue (again, Weldbond), then turning it upside down and tapping the bottom to knock off any excess. Then I glue one some small bits of clump foliage for the little bushes.